The sounds of construction will soon be replaced with those of treadmills running when the relocated and remodeled Viceroy fitness center opens on December 15. For now, work is continuing to move the Fitness Center to the former Nest location, which will allow owners and guests to enjoy a brighter and lighter workout. Windows showcasing the pool and slopes will become the architectural focus. Nest will fully reopen next spring in it’s new poolside/slopeside location. 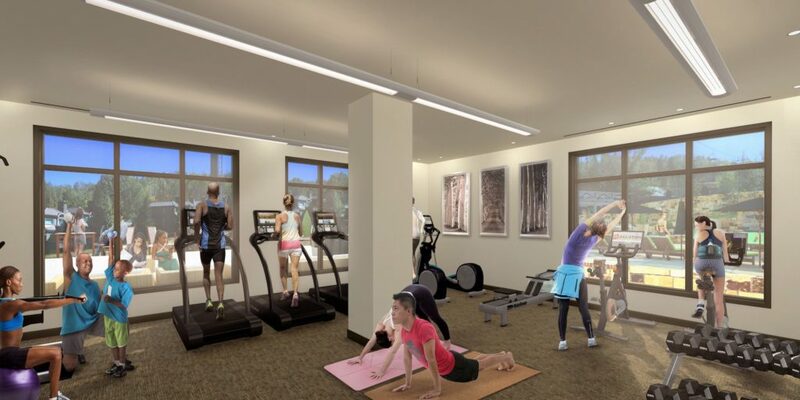 The fitness center will also be replacing the tables and chairs from Nest with state-of-the-art workout equipment like Peloton exercise bikes and the high-end Woodway brand treadmills, as well as other weight and cardio equipment. With Peloton, you can have thousands of on on-demand classes anytime and 14 classes streamed live from NYC’s best instructors so you can get your workout in whenever you want it! The Fitness Center is open 24 hours for everyone’s convenience. The fitness center remodel is part of an over $4 million refresh currently being undertaken at the Viceroy Snowmass which will transform the lobby, the restaurant and lounge, as well as add Cafe V, a new modern coffee bar.